We caught Amy here on a short three-month modelling stint, and although she says one of the things she dislikes most about her job is that she never stays in one place for long enough, she loves all the other perks her job comes with. “I love meeting new people, exploring new places, being a part of photo shoots and walking the catwalk for awesome designers,” she says. 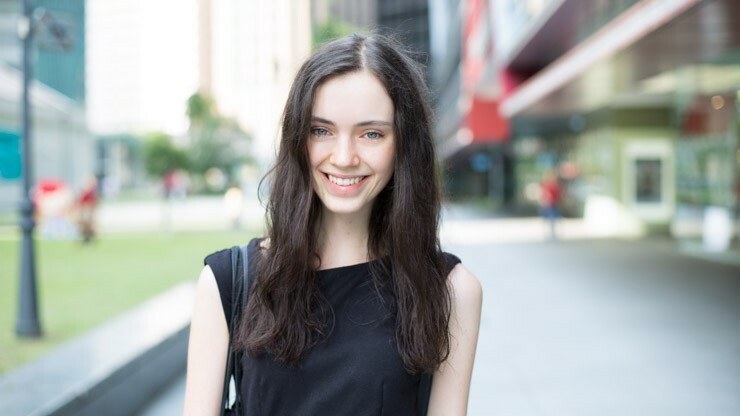 “My job is absolutely amazing because it lets me do all these things and I always have fun doing it.” Back home in Perth, Amy says that she’d probably be studying psychology and gender studies, while working part-time in sales. Being away from home so often means that she often has to make sure she can juggle both her work and time with her family, however. “Family is a very important part of my life, so when I’m away I miss them very much. I cope by keeping my goals in mind, practicing mindfulness and really trying to enjoy my life exactly where I am. I always talk to them regularly on Skype and keep them updated with what’s happening in my life so I never feel disconnected from them.” Spending so much time on her own also means that Amy has had to develop a strong mental mindset. “My advice is to stick to it,” she says. “Everyone starts somewhere, and even if you start at the bottom, work hard, help others, and listen to your employer, colleagues and customers on what you can improve upon. If you really apply yourself, keep up a high work ethic, and are respectful of others, you’ll go far.” Exemplifying the model-off-duty look with a simple black dress and sneakers, Amy sometimes wishes she could just throw on a pair of shorts or a skirt to cope with the weather, but still finds it more important to dress to impress. “I keep cool by bringing an umbrella to block the sun, or stand in the air con for a little bit to cool down.” Her role models in life? Her mother, and her little sister.